Description: Lonnie's Tomahawk Hammer is very traditional in style. 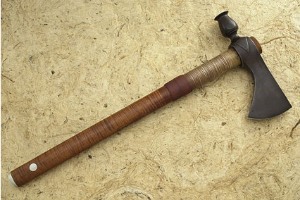 The synthetic sinew and leather on the handle give an excellent grip for using the hammer. The pewter accents are poured directly into wood and then finished. 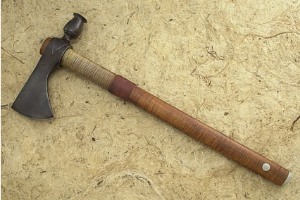 The maple handle is beautifully colored and figured. The head is carbon steel with a patina finish. The head length is 8-1/4" and the cutting edge is 3-1/3". The hammer is 1-1/5" across. 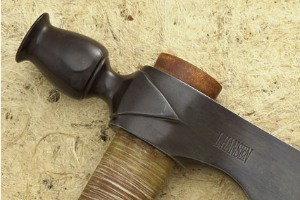 This piece is very sturdy and well weighted for chopping as well as hammering. 0.0615234375 0.0615234375 61.5234375 61.5234375 Header Started. 0.8583984375 0.140625 858.3984375 140.625 Trailer Started. 1.171875 0.3134765625 1171.875 313.4765625 Trailer Completed.